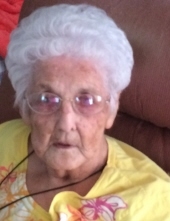 Clara “Irene” Roope, 90, of Welch WV left this Earth for her home in heaven on Monday, April 15, 2019. Born July 11, 1928, in Coalwood WV, she was the daughter of the late Willie and Caroline Walker Surratt. She was a lifelong member of Anderson Memorial Presbyterian Church; where she taught Sunday school for many years. She loved her Church Family. In addition to her parents, she was preceded in death by one son, Randy Roope, three sisters, and one brother, her infant twin brother and infant sister. Survivors include her children, Ginger Radford and husband John, Mary Dawn Lockhart and husband Wallace, Kimberly Grubb, Greg Roope and wife Carla, ten Grandchildren, eighteen Great Grandchildren, two Great Great Grandchildren, and two brothers, 4 nieces and 2 nephews. Funeral Services will be conducted Friday, April 19, 2019 at 12 Noon from the Fanning Funeral Home Chapel in Welch WV, with Pastor Chuck Hammond officiating; interment will follow at Roselawn Memorial Gardens in Princeton WV. Friends may call Friday, April 19, 2019 from 11 A.M. to Noon at the Fanning Funeral Home Chapel in Welch WV. The family would like to thank the Staff at McDowell Nursing and Rehabilitation for their kind and compassionate care they gave their loved one. Special thanks to Helen Clemins for her excellent care. Fanning Funeral Home of Welch is serving the Roope family. To send flowers or a remembrance gift to the family of Clara “Irene” Roope, please visit our Tribute Store. "Email Address" would like to share the life celebration of Clara “Irene” Roope. Click on the "link" to go to share a favorite memory or leave a condolence message for the family.